Can you believe it? Students are already back to school in our hometown of Atlanta. All high school girls have a lot of responsibilities to juggle: school, their first job, peer pressure, social lives and the often overwhelming insecurities that come along with being a teenage girl. But imagine adding motherhood to that mix. And picture that young girl living below the poverty line in a home that is less than peaceful. This exact situation is the reality for many of the girls that are served by YoungLives, a mentoring ministry for teenage moms that Hungry For a Day is partnering with this month. YoungLives pairs teen moms with other women mentors who encourage and support these young moms as they simultaneously navigate two of the most challenging stages of life: the teen years and early motherhood. The Atlanta YoungLives group just started this year, but they’ve already met moms like Tina*, a 16-year old girl whose son was born in April 2017. Tina works 20+ hours a week at a fast food restaurant, and helps raise her younger siblings in addition to caring for her newborn. Another young mom, Amanda* just joined the military in hopes of putting herself through college one day and providing for her now 7-month old son. Amanda graduated on time with the rest of her class despite dealing with significant stress during her senior year, such as figuring out how to pay for both daycare and a prom ticket; she also lives out of her school district and had a 2 hour commute on public transit each way to school. Tina and Amanda are beating the odds by raising their children and staying in school, and YoungLives exists to cheer them on along the way. Although YoungLives is primarily focused on building positive relationships with teen moms, there are often significant tangible needs that these moms and their babies have. 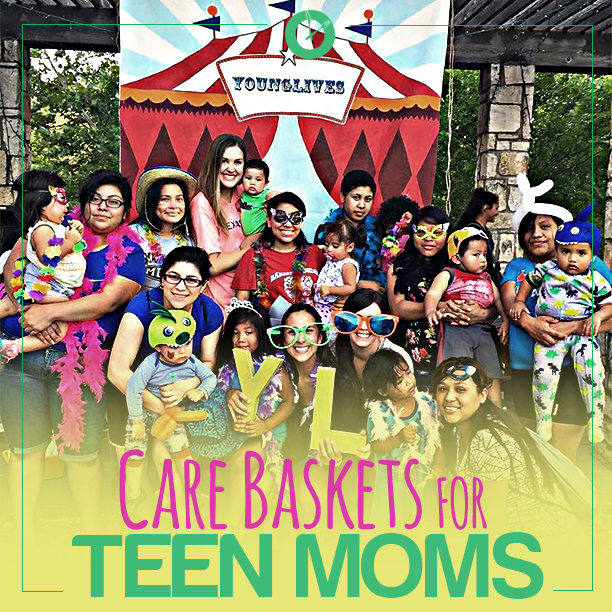 The Atlanta branch of YoungLives loves to gift new teen moms with a care basket upon the birth of their child, and we’re asking YOU to fund these baskets for the 2017-2018 school year. The baskets not only contain some basic staples (such as diapers, wipes, formula) that are often much-needed by these new moms, but they are a reflection of the fact that someone sees these girls and their struggles, accepts them despite their unique position, and cares about both the mother and the child. You can provide a basket for only $110 that provides these new mothers with formula to feed their baby as well as other much needed supplies. Click HERE to give as we lean in with YoungLives to show these new moms and their babies that they have people in their corner! *Names have been changed to protect the privacy of our mentees.